I spent the first 22 years of my life in and around New England, oblivious to the diversity of fungi in the neighborhood. The other day my brother was visiting our parents in Connecticut and noticed a parade of mushrooms on the lawn. Identifying fungi via smart phone is a notoriously dumb idea, so I'm sending them a copy of Lawrence Millman's new field guide to the Fascinating Fungi of New England. 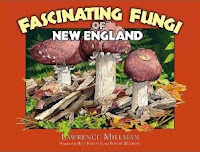 Millman is a mycologist and adventure writer living in the Boston area. I first met him virtually when we exchanged copies of our books a year ago. His Last Places: A Journey to the North is a witty jaunt to the bleak yet beautiful ports of call at the top of the world. A field guide may seem like a different sort of embarkation for a writer of Millman's abilities—and we should all be thankful for this detour. Millman joins David Arora as a practitioner of an increasingly popular genre—the nature field guide—who refuses to sacrifice points of style and wordsmithing. Because of their work, mycology enjoys a clear advantage over other related disciplines (birding, botany, butterflies, and so on) in the reading department. You might just as likely read Millman's description of Amanita muscaria before bed as leaf through the book looking for that strange Agaricus in your compost pile. The "fascination" of the title is well earned. Through sidebars and species descriptions peppered with oddball details, Millman explores any number of fungal fronts, from the bioluminescence of mushrooms to the world's largest organism, a species of honey mushroom (Armillaria ostoyae) covering 3.5 square miles of Oregon's Malheur National Forest. On the bleeding tooth (Hydnellum peckii), he explains that the red droplets oozing from an otherwise white fruiting body are not the result of a "bad dental problem"; rather, the fungus is engaging in the little understood act of guttation—exuding reddish water—possibly to allow for better sporulation. The train wrecker (Lentinus lepideus), with a mycelium resistant to creosote, gets its common name from a tendency to fruit on milled timber such as railway ties or telephone poles. Millman's identifying tips are clear and detailed, and the color illustrations by Rick Kollath are quite good, with handy visual cues such as spore prints and gill types (e.g. adnate, free, etc.). But it is the rest of the text that will inspire closer outdoor observation and keep you thumbing through the pages—to see whether that cluster of morbid protrusions in the flower bed is the dead man's fingers (Xylaria longipes) or whether the ruffed grouse look-alike on the maple out back is the tasty and salubrious hen of the woods, aka maitake (Grifola frondosa).